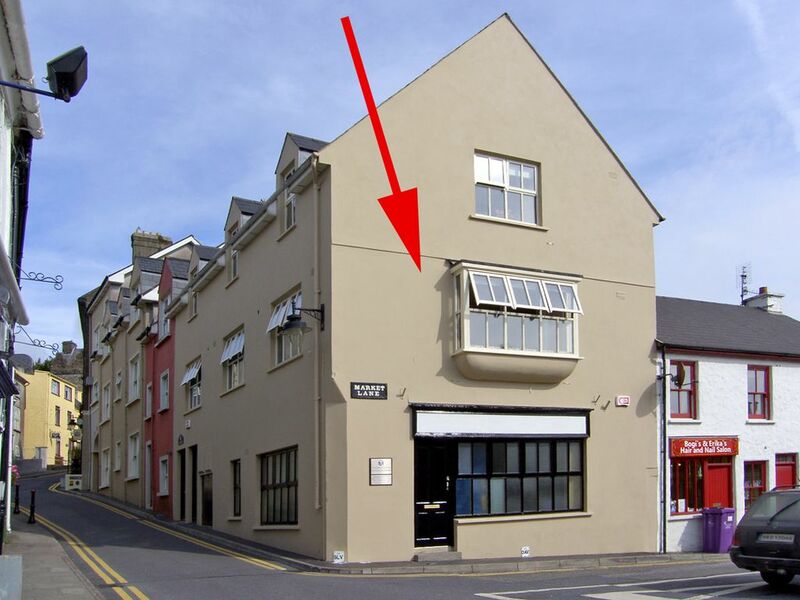 This immaculate first floor apartment is in the heart of Kinsale town with its gorgeous winding streets and eclectic mix of shops and restaurants. Designated an Irish Heritage town, Kinsale is captivating with its beautiful setting along the waterfront, narrow streets and Compass Hill rising steeply above it. There are two nearby golden sandy beaches - Garretstown and Garrylucas where you can while away blue sky summer days. It is just 17 miles from Cork city where you will find superb shopping and even more narrow winding streets! Also visit Tap Tavern pub, the oldest pub in Kinsale, or take the ghost tour from Tap.Shop. Pub. Restaurant 300 yards. Beach 1 mile. FF: lounge/kitchen/diner, double with ensuite shower room, twin, bathroom with shower over bath.Electricity included , storage heaters, linen and towels included, TV, CD, fridge with small ice box, microwave, dishwasher, washer/dryer, on street parking. Sorry no pets.